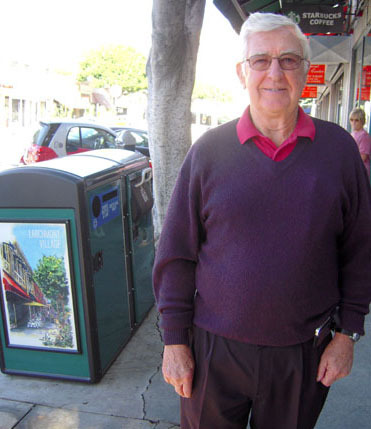 HEAD of the Larchmont business district Tom Kneafsey in front of the new bins. They are amazing, according to an informal survey of five solar-powered trash cans and two recycling bins that debuted on Larchmont Blvd. last month. Eventually a total of 15 trash and three recycling bins are planned for the $60,000 program paid for by Councilman Tom LaBonge’s office. “I think they’re wonderful,” echoed Tom Kneafsey, head of the Larchmont Village Business Improvement District. The trash containers will save the District $25,000 a year in pick-up costs, he added. Holding up to four times as much litter as their older counterparts, the BigBelly Solar bins compute the compacted waste via an electronic alert system for pick ups as needed. In contrast, trash is collected twice a day from the older, cement containers. Decorated with posters of Larchmont Village, events such as the Larchmont Fair can be advertised in the side slots, Kneafsy said. Initially some area merchants weren’t too keen on replacing the 23 cement containers with the sleek newcomers. The double trash/recycling bins can block storefronts, they fear. 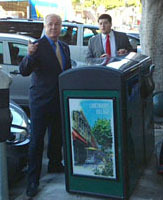 KICKING OFF THE pilot program last month were Councilman Tom LaBonge with his field deputy Ben Seinfeld. But so far the pilot program is getting rave reviews. “They’re better than the last ones, and they look great too,” said Gene Gaddy, walking by one outside of Noah’s Bagels. Arlene Herrera thinks the boulevard is moving in the right “green” direction. Wella Tan, who also lives in Larchmont Village, had seen similar ones at The Grove, and was pleasantly surprised to find them in her neighborhood.